The victim is Davey Caine. He is the heir to the criminal empire created by his father, William ‘Billy’ Caine. Billy is a notorious and violent gangster who controls South East London. But he’s not the man he used to be and the sharks smell blood in the water. Detectives Ray Paterson and Johnny Clocks must find the killer before Billy extracts his own brand of justice. They are drawn ever deeper into London’s underworld. Paterson is offered the chance to stop the conflict dead in its tracks. If he ignores it, the mayhem continues. If he takes it, there will be a price to pay. I absolutely love the series featuring Detectives Paterson and Clocks and I impatiently wait for each new book in the series to be released. I eagerly snatched up my copy of the third book in the series called ‘The Burning Men’ and started to read. Blooming nora it is certainly one hell of a read that I absolutely loved but more about that in a bit. I have developed a real soft spot for the detective partnership of Detective Superintendent Ray Paterson and Detective Inspector Johnny Clocks. Paterson is a career detective who likes to do things by the book. He’s charming, kind, gentle, tactful, diplomatic and he is a policeman who certainly gets results. Paterson is a bit of a hard nut, he stands up to bullies and monsters and he doesn’t scare easily. As for Clocks, well what can I say? He needs a refund from whichever charm school he attended because it clearly hasn’t worked. Clocks is blunt, he tells it like it is, he doesn’t scare easily and he is also a clever man. He deliberately provokes those people he and Paterson go to question, so that Paterson can then play good cop in the hope that the insulted party will give away more information than they at first intended. Clocks is also sneaky and secures information by any available means. He certainly has his ear to the ground. Paterson and Clocks work well together but then each is the opposite of the other- a bit like chalk and cheese. This case tests them in more ways than one. Oh my giddy aunt ‘The Burning Men’ is one hell of a fantastic book that had me on the edge of my seat all the way through. The story starts in such a way that I am not likely to forget in a hurry. For me, the story hit the ground running and maintained the pace throughout. The author tempts you into the book and then refuses to let you go. As soon as I started reading, I felt as though I was reuniting with old friends in Paterson and Clocks. I was pretty much addicted to reading this book by the end of the first page. I found it impossible to put the book down because I had to keep reading to see if Paterson and Clocks solved the crimes, who was responsible and why. I didn’t realise just how quickly I was racing through the book until I looked up and saw that I had cleared 40% of the book. I was so focused on the story, the characters and the crimes that the pages seemed to automatically turn themselves. I had mixed feelings about finishing the book because on the one hand I was pleased to finish because I knew how the story ended but I was disappointed to finish reading because I was enjoying the author’s writing style, the storylines and the characters so much that I just wanted the book to continue. 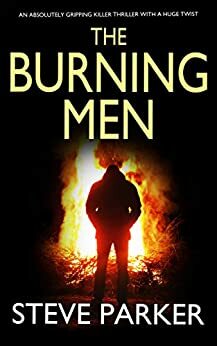 Reading ‘The Burning Men’ was very much like being on a very scary and unpredictable rollercoaster ride with more twists and turns to the story than you would find on a ‘Snakes & Ladders’ board. There were also several unexpected moments that crept up on me and left me feeling as though I had been punched in the gut. There were times when I almost had to read between my fingers because I feared what was going to happen and the possible implications for Paterson and Clocks. In short, ‘The Burning Men’ was one fantastic read and I thoroughly enjoyed it. For me, this is the best of the series so far. The ‘Paterson & Clocks’ series goes from strength to strength. I would definitely recommend this series to other readers. I can’t wait to read what comes next from the ever so slightly scary mind of Steve Parker. The score on the Ginger Book Geek board is a very well deserved 5* out of 5*.